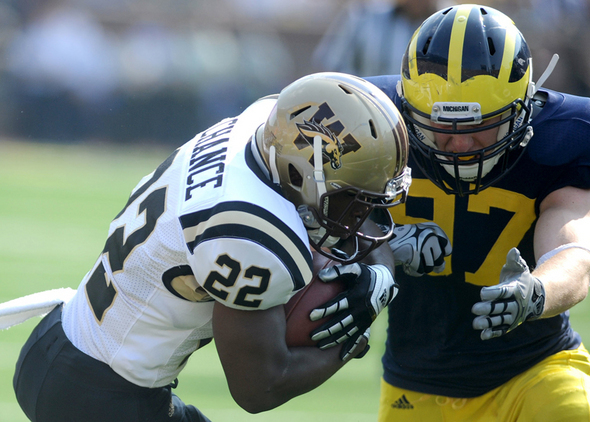 Posted on Wed, Feb 15, 2012 : 6:10 p.m.
Michigan freshman Brennen Beyer tackles Western Michigan running back Dareyon Chance early this season. The Michigan football team seems to have already taken its first step toward addressing the massive losses it sustained along the defensive line. The Wolverines will be without three starters from last year's 11-2 season: tackles Mike Martin and Will Heininger and end Ryan Van Bergen. Their only returning starter up front is Craig Roh, who played weak-side end. Now, it appears reserve linebacker Brennen Beyer will move to Roh's weak-side end spot, and Roh will slide into Van Bergen's strong-side end position, according to MGoBlog. The website reports multiple Michigan coaches said last week at the Glazier Clinic in Novi that defensive coordinator Greg Mattison has already executed the move. Beyer played well as a true freshman last year after earning more snaps down the stretch, but was buried behind redshirt freshman Jake Ryan at strong-side linebacker. Now, he'll presumably compete for playing time at weak-side end with returners Jibreel Black, who will be a junior, and Frank Clark, a sophomore. Roh will man the other end. It remains unclear what the team will do to account for the losses of Martin and Heininger in the middle. The leading candidates are believed to be Will Campbell, who will be a senior but has started only once; little-used Quinton Washington, who will be a sophomore; and Ondre Pipkins, a highly touted incoming freshman. At linebacker, Michigan remains deep despite Beyer's move. All three starters return, including Ryan on the strong-side. Backup Cam Gordon is back, as well. Thu, Feb 16, 2012 : 6:57 p.m. This announcement, coming roughly 1 month ahead of Spring practice commencing, tells me that Mattison is being to resort his resources, and beginning to set in place, the learning curve for both Roh and Beyer. I think we have decent talent on defense, but they are still lacking in game experience. Look for more battles during the spring, and Will Campbell to be pushed HARD ,in the middle. It's 'show time' for big WillS, and dOn't be surprised if he gets passed. And while I believe this team will have a GREAT year, I also doubt seriously, that they will be able to standup to Alabama in game one. I caution fans here, to be realistic in the opener and stay with the team coming out of that game. As I did with team 132, I felt that, 'if they stayed reasonably injury free', that they would finish with 10 or 11 wins. The same is true for team 133. I think they can finish, in league title game, with a real shot at the rose bowl, and aother 11 win campaign. I think the Nebraska game is the 'big one' this year. But I do think UM beats both ohio &amp; state. These are great kids, but they are YOUNG.....and Alabama will be a real 'eye opener' for these kids! Go Blue! UM is young on defense, but i wouldnt say inexperienced. Many of the freshmen started or seen other significant time. Obviously, they dont have the experience of a Junior or Senior, but they are about as experienced as they could be coming into next year as Sophomores. Bama will be playing a lot of inexperienced players as well. They are losing a lot of their Defense, so that should bode well for UM. (Especially since its the first game of the year.). I'd say overall, UM will be the more experienced team, but Bama has the edge in overall talent. It will be a very tough game, but im still REALLY looking forward to it. Thu, Feb 16, 2012 : 3:44 p.m.
Thu, Feb 16, 2012 : 3:36 p.m.
Good move COACH Mattison! Earlier this morning it was reported that COACH Borges was seen touring the campus with new MEEEEANchigan recruits Abe Gashoob, Chris Voitchick and Richard Pumpaloaf!!! It has been reported that they were seen at Zimmermans deli for breakfast and then stopped by the Krispy Creme to grab a few travelers. MEEEEANchigan football will roar with Voitchick, Pumpaloaf and Gashoob! Details tonight at 6:00...you can watch it on the tube! Thu, Feb 16, 2012 : 3:04 p.m.
&quot;The leading candidates are believed to be Will Campbell, who will be a senior but has never started..&quot; I thought he started in, and played most of, the Sugar Bowl. Thu, Feb 16, 2012 : 8:37 a.m.
Ok, let's see here.....so we went through year one with Hoke &amp; Staff, many people had doubts and thought we would win 7-8 games at most. Within a short period of time our coaches taught guys how to really play the game, improved their techniques and game planned them into 11 wins with not the most ideal skill set for what they want to eventually do. My point is that I think we'll be fine from now on, we're in great hands folks, the future is bright and the trials and tribulations we went through are over, have confidence will travel, a better than average bear said once, I think, Go Blue!!! Thu, Feb 16, 2012 : 5:52 a.m. This move may make a lot of sense in theory, considering Roh has put on a lot of mass over the past year and a half and Brennen Beyer looked more like a LaMarr Woodley type linebacker anyway. The only problem that I foresee is some mistakes Beyer has made in terms of discipline on outside contain. Playing weak side rush-end means that he will be responsible for forcing stretch plays and option reads back inside, towards the center of the defense, while also attempting to pressure the quarterback. This means he will have to be very cognizant of where the ball is and his role changes drastically depending on what the offense does. At linebacker, we saw Beyer get burned multiple times on these types of plays. This can easily be written off as freshman mistakes (we saw the same problems from Desmond Morgan) however we also have no proof that those mistakes have been or will be corrected in time for Alabama. I guess we just have to trust in the Mattison. Hail. Thu, Feb 16, 2012 : 7:27 a.m.
Those are mistakes Freshmen typically make. I expect the containment issues to be mostly resolved this year. Considering UM's two OLBs were freshman, and there were times when there was inexperience rotating in at DE, some issues are not surprising. Thu, Feb 16, 2012 : 3:40 a.m.
Thu, Feb 16, 2012 : 3:35 a.m.
All the guys mentioned are quality players with plenty of versatility. Jake Ryan...awesome year. Pipkins may take on Campbell in the middle. I cant help but root for Will Campbell, it is his time to shine and I like Pipkins attitude. Clark and Black are very athletic as well. Beyer can play the weak side end, he has the linebacker speed to slow the RB's trying to get to the perimeter. We got better at the perimeter defense last year, and this year it needs to be iron clad. It starts with Alabama, as we should face the running back from Orlando that picked Alabama over Michigan prior to last season. I forgot his name, but Richardson was just that good. Anyway, big blue looking to be a physical football team on both sides of the ball. Toughness, grit, and the will to win is how it is done to win the big ten conference and a national championship...ya I said it! Go Blue. Thu, Feb 16, 2012 : 12:24 a.m.
OK - I researched my own question- get a life huh. The weak side DE should be the fastest and most athletic since he doesn't have to stack up against the TE and needs to focus more on the pass rush. The strong side DE tends to be less fast and athletic but stronger in stacking up against the TE and stopping the run. Ain't Google wonderful. Thu, Feb 16, 2012 : 12:12 a.m.
Chiro 19: I guess I lack knowledge of why a guy who wasn't very good at weak side DE would be better at strong side DE. Is strong side easier to play? Why? Wed, Feb 15, 2012 : 11:53 p.m. This move makes a lot of sense because Roh was not very good last year and is a liability on the weak side. I fully expect the Dline to look good in the Spring game and then in the Bama game. The LB's should be able to pick up the slack as well since they are so deep and talented there. It will make up for someof the lack of experience up front. Go Blue!! !